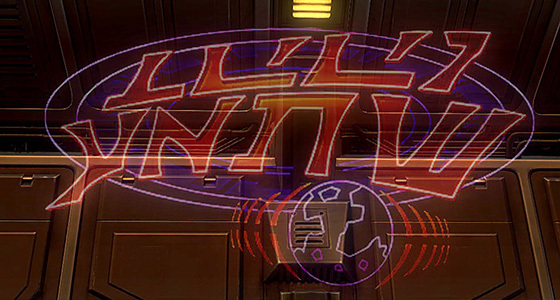 This week, let’s continue to examine some of Nar Shaddaa’s neon signs, focusing on two that Sith faction players will see as they enter the infamous Star Cluster Casino. 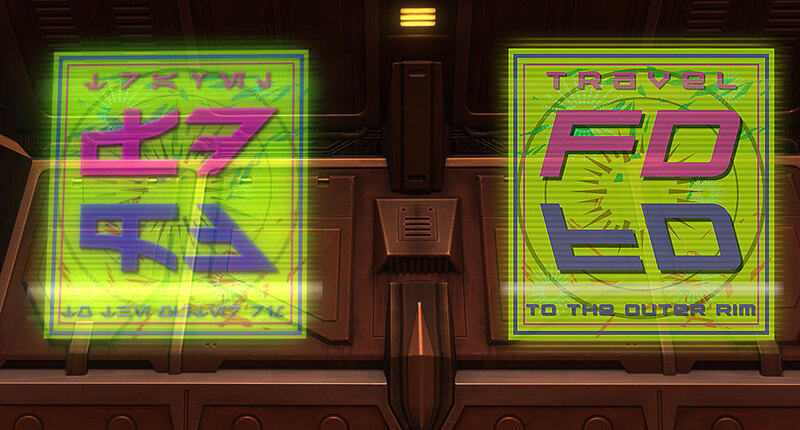 First up, we have something that at first seems to be another standard, simple advertisement exhorting viewers to travel to the Outer Rim, but there is quite a bit going on here, with several layers of graphical elements including rectangular and circular frames, two different starburst graphics as well as two different colored scattered accent shapes. Recreating this in English was a bit more challenging than I expected it would be! 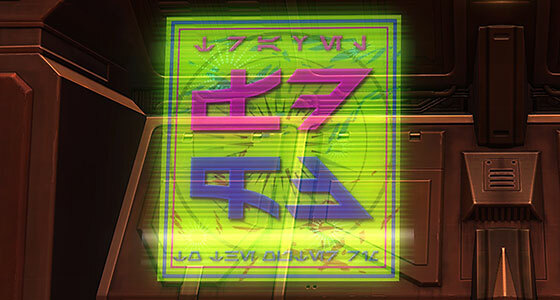 This sign, which can be seen prominently on the Nar Shaddaa loading screen, is, of course, not written in Aurebesh, but looks to have been created using Erik Schroeder’s font Sith Prophesy which models the language officially known as Common Sith. This language mainly appears in Star Wars as the writing seen on Darth Vader’s chest control panels. 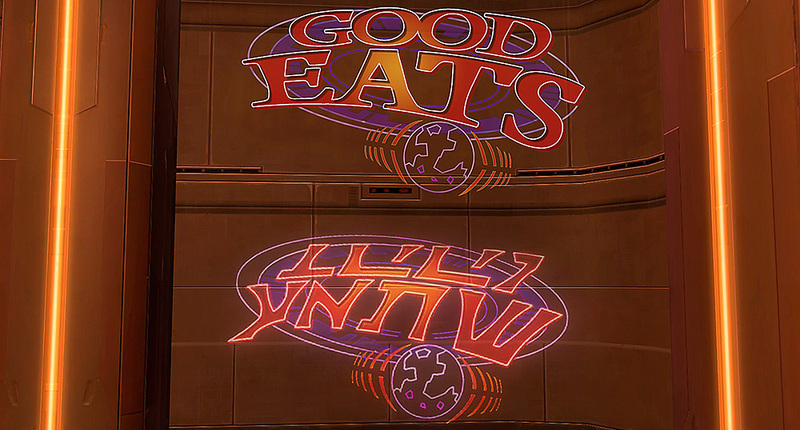 Given that pureblood Sith are common in SWTOR’s setting it’s not surprising that they’d have restaurants and advertising aimed specifically at them, although I confess I wonder what constitutes fine dining to a Sith. This sign’s translation is a fairly common diner name, but I imagine it might also be a reference to Alton Brown’s beloved television show. Patch 5.3 brought a bunch of stuff including the controversial change to tunings (I’m fine with it, especially once unlocked crystals and tunings become mail-able in legacy weapons) and the second encounter in the Gods from the Machine operation (crazy, fun fight! ), but the one I’ve spent the most time with is the new Manaan stronghold. I thought I’d share a few impressions as I work my way towards 100% completion. First off, it’s beautiful and I’ve absolutely enjoyed my time decorating. My complaints are mostly the familiar decorators’ laments about hook placement and type. Why aren’t the rug hooks where I want them? Why won’t that deco go up against the wall? Why won’t that deco fit on that hook? Manaan does have a few specific issues. I’ve heard some folks complain that it’s too small, but after the massive sprawl of Yavin, I’m okay with a smaller stronghold. However, its size is actually deceptive. The stronghold’s main staging area is actually huge, but it kind of feels small. Yavin’s Temple Grounds area is much larger to be sure, but that section is subdivided into distinct areas (the temple roof, the bridge, the paved platform, the various clearings, the cave, the swimming hole out back, etc. ), Manaan’s main area, on the other hand, is just one connected and visually identical area. I think this section could’ve been better subdivided using elements from the existing Manaan zone such as the tunnel that splits the two open areas and the side office in which we met Theron and Lana during Forged Alliances. I welcome the generous inclusion of numerous centerpiece hooks (especially the ones on the ocean floor), but it’s frustrating that the alternative layouts for centerpieces are not great. Two out of the four options waste fully half of the hook space, and the other two can be awkward to use. This is especially the case in the two side rooms on the Underwater Observatory level. If you don’t want to place a centerpiece, getting those rooms just right can be a tricky. Personally I’d like to see an alternative layout (seen below) with both horizontal and vertical orientations for the Centerpiece hook that consists of two large hooks, flanked on either side by a mix of medium, medium narrow and small hooks. The small wall hooks in the ceilings of those two rooms are a strange choice. I get that many large ceiling decorations might clip in those spots, but many other fixtures such as hanging lights and chandeliers would fit wonderfully. I know that Manaan’s architectural style doesn’t lend itself to large, flat spaces, but it should be up to the decorators if we care about the clipping. Otherwise, I’m not a fan of the invisible wall outside the rooftop garden. I imagine that the entire complex is probably not fully rendered, but I do wish I could explore more. And even if I can’t decorate the interior spaces below the garden, I’d still like to place decorations on the roof down there. My last Manaan specific nitpick concerns the elevators in the stronghold. When you exit them, your character is facing the elevator, forcing you to turn around whenever you enter a new level. You really should be facing the room as you step off the lift. Finally, I thought I’d conclude with some general Stronghold and decoration changes I’d like to see. I like the hook system, I really do. Working within limits prevents me from going too far down the decorating rabbit hole and has sparked some creative solutions, but it could use some tweaking. My main frustration is this: which decorations fit on which hooks has never been consistent. A café table will fit on a medium hook, but the similar-sized Dejarik table will not. Why? If a decoration can even remotely fit on a hook, we should be able to place it on that hook. I’d like to see the hooks for every decoration given another pass. There are many large decos that would fit just fine medium hooks, and it sometimes feels like the designers have forgotten the medium narrow hook even exists. The introductory cut scene currently plays whenever you zone into Manaan, and I’ve seen this described as a feature not a bug. While I don’t want to have to spacebar through the scene every time I go to my stronghold, I will say it is sometimes cool to see that scene play once there are decorations in place. It’d be nice to have an on demand option to take the tour of a stronghold after each characters’ first visit. Could an option to watch the scene be added to the control panel that exists in every stronghold? I was pleasantly surprised by how much I enjoy decorating strongholds, and Manaan has not been an exception. It is easily the most scenic stronghold and while, unlike Coruscant, it doesn’t feel like a place I’d live, it sure is a beautiful place to visit. I look forward to basking in the sun and putting the last decoration in place in the not too distant future.